Marsh and Guy Carpenter announced today [Dec 14] a donation of 80 holiday boxes to Big Brothers Big Sisters of Bermuda [BBBS], a mentoring programme dedicated to helping children and youth primarily from single parent homes. Bowring Marsh employee Jahan Cedenio coordinated Marsh and Guy Carpenter’s Big Shoe Box Giveaway in which company employees shopped for and wrapped holiday boxes for the 80 children in BBBS who could benefit from donated holiday gifts. Bowring Marsh employee Julian Nelson dressed in a Santa Claus outfit to deliver the boxes to the children. In each box was a “wow” item, meant to capture the child’s attention, school supplies, toiletries and other basic necessities. “On behalf of Big Brothers Big Sisters of Bermuda I would like to thank Marsh and Guy Carpenter for spreading Christmas cheer to our Littles this holiday season,” said Patrina O’Connor-Paynter, Managing Director of Big Brothers Big Sisters of Bermuda. 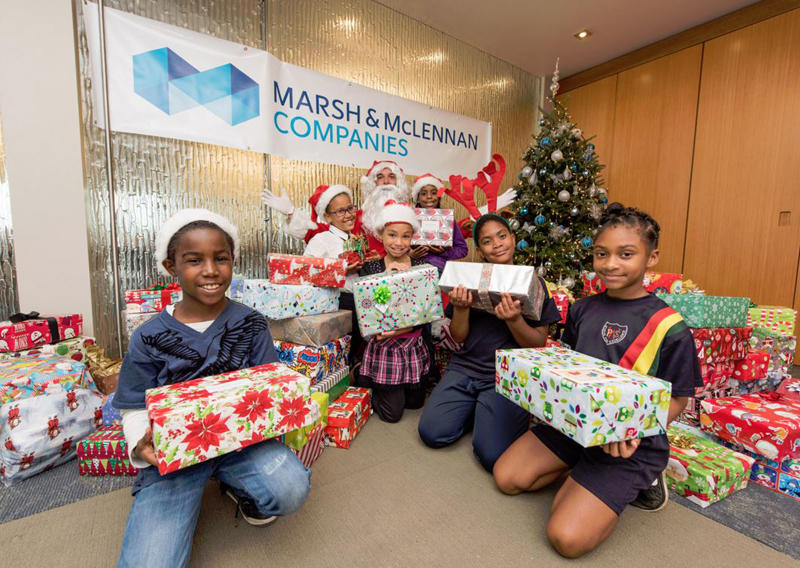 “The holiday season is a time for giving and remembering those who could use a little help, especially children,” said Jill Husbands, Country Corporate Officer of Marsh & McLennan Companies, Bermuda and Chairman of Marsh’s Bermuda Charity Committee. To learn more about Big Brothers Big Sisters of Bermuda, visit, www.bbbs.bm.